Before the first rhabdo case was brought to our attention, we regularly warned of CrossFit’s potency wherever we had the opportunity. In the January 2005 issue of the journal, we offered the following caution for newcomers tackling the WOD (workout of the day): “Countless bad-asses from sporting and special operations communities, long regarded as bulletproof, have been burned at the stake of ego and intensity.” As it turns out, the burning is rhabdo, and we now find ourselves obligated not just to explain CrossFit’s potency but to warn of its potential lethality. We can dispense with much medical detail with a quick and easy description of rhabdomyolysis as a potentially lethal systemic meltdown initiated by the kidneys in response to the presence of shed muscle-fiber debris and exhaust in the bloodstream. There are several causes and types of rhabdo, classified by the underlying cause of muscle breakdown. With CrossFit we are dealing with what is known as exertional rhabdomyolysis. It can disable, maim, and even kill. To date we have seen five cases of exertional rhabdo associated with CrossFit workouts. Each case resulted in the hospitalization of the afflicted. The longest hospital stay was six days, the shortest two days. All have made full recoveries. The hardest hit was extremely sick, the least afflicted had no complaints other than soreness. All were extremely sore. 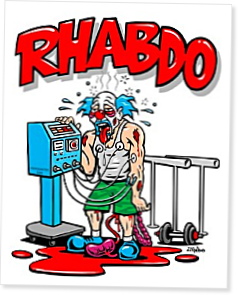 Soreness doesn’t adequately explain the discomfort of rhabdo, however. The worst hit, a SWAT guy, recounts that six days of intravenous morphine drip barely touched the pain. My first (and hopefully last) exposure to rhabdomyolysis was in Florida on the Gulf of Mexico. It was an average day, not hot and not humid. Our exercise began early and I finished early. A "rushing" sound developed in my eardrums, as if I had a seashell pressed against my ear, and assumed it was just sweat in my ear canal. I woke up in an ambulance many minutes later and then again in the ER. Sore couldn't even describe how my body felt. It hurt to even think about moving. For a few minutes after waking I could not remember who or where I was. Three days of I.V. fluids and I was back in action building myself back up to normal. I didn't realize until recent just how close of a call I'd had. It would be silly to think that ballistic stress to a high degree is without risks. Most risks are usually of an injury nature. But you have to keep in mind there are plenty of conditions that one can create by over doing it. Many who are on supplements, do not take in enough water or good nutrients, haven't had enough sleep all put you at more risk while doing ballistics activities. Though there is no direct correlation that we know of creatine increasing your risk for exercise induced rhabdomyolysis, there is a correlation that supplements causing water loss or diuretic effects will increase your risk not just of rhabdo but also hyponatremia, neuromuscular dysfunction and even metabolic acidosis.....the thing one should consider is do yourself a favor and use common sense when you exercise, make sure you use rest and proper nutrition if you are going to take your body to the brink of hell and expect to bring it back. I wish I had read this article before my hospitalization for rhabdo. I thought I was in shape and had been Crossfitting beforehand and took a long break. Like it was mentioned in the article, my ego got the best of me! I am 42, and was scoring high in the Army APFT and got back into Crossfitting too fast and too hard. I started on a Tuesday and by Thursday's workout I was hurting but kept going. That night my back felt like it was trying o curve up to my head and I could not move my legs. Then real pain hit...everything hurt beyond explanation. I had to call a friend to pick me up and drive me to the ER. I was urinating dark red/brown urine and in utter pain. They hit me with 3mg of diluadid and it did not even touch the pain. It was so bad I was throwing up from the pain. I was released from the hospital and sent home. I was back in the ER on Saturday and again they misdiagnosed me and sent me home with painkillers. I was swelling up so much I could not put on my pants. Monday morning I went to the TMC and passed out there. Finally someone listened to my description and after blood and urine tests I was sent to the hospital and entered into ICU. Normal CK (creatine Ketone) levels are roughly between 100-150...mine was over 40,000. I spent 5 days hospitalized (3 in ICU), they had me on a morphine drip along with dilaudid shots and percocet and plenty of IV therapy. It's been 2 months since that episode, and I am still recovering. My lower back is completely numb from just above the sacrum to halfway down my buttocks. I am back trying to run again and it is a painful process. No one should jump in to a full workout just because they use to do it. I've learned my lesson and I hope no one has to go through rhabdo...work up to it and recognize the symptoms. If you do happen to get symptoms and go to get medical help, let them know what you are feeling and to conduct tests to rule out rhabdo or catch it early on...5 days with acute symptoms is a very painful experience and you can seriouly be hurt with renal failure or a myocardial infarction. I just spoke to an acquaintance of mine who told me about this rare problem he had that almost cost him his life. After reading this article i realized that the symptoms that he described and the ones listed here were the same. I actually approached him and told him about this article. He said that it was Rhabdo supposedly caused by an unknown virus. I asked him if he was training above and beyond what he normally did (He was a pro mountain biker) and he said that he was pushing it hard to get ready for a upcoming race. From what I understand it only affects a small population. How and why I am not sure. Final point: He said he would rather die than go through that process again. My step-daughter (24 years old) went to her first crossfit class over Thanksgiving. She is in the hospital on an IV as I write this diagnosed with Rhabdo. She is swollen, in pain and very mad at me. I was just released today from the hospital for rhabdo. I spent 6 days there. Thankfully I knew the warning signs (thanks to articles like this one) and as soon as I saw brown urine, I knew what I was facing. My CPK (creatine phosphokinase) levels peaked at 125,000, but are down to 1400 as of right now. The doctors said they had never seen such severe rhabdo from someone who hadn't been burned or crushed (even from ironman triathletes and marathon runners). The movement that did me in: GHD situps. There are a few underlying reasons that I can come up with as well: the movement has a large eccentric component (flexing when your back and hips are in hyperextension at the bottom), it was quite hot that day, I had probably been over-working my abdominal muscles in the workouts before, and I hadn't done GHD situps in a few months. Take care with any movement with a highly eccentric component to it, especially if you have not done it much in the past. Listen to your body, and don't be afraid to stop the workout if anything feels wrong. Trust me, you don't want to be stuck in a hospital for a week having to be pumped full of saline and morphine, peeing into a jug all the time. It's not as fun as it sounds. There are a few examples in the article about people being hospitalized for rhabdo from soreness. I'm assuming this was not their only symptom? The first one didn't even feel sick. Is the brown urine the best indicator? I'm not really sure how to best distinguish rhabdo from just being normally sore and DOMs. Essentially I'm trying to figure out when to seek help since I've just started crossfit and am concerned. Sixteen years ago I moved from Austin to California to start a new job. I was 28 years old and a former high school athlete. The first week on the job a co-worker invited me to go work out with him. I don't remember everything the workout included, but I do know he had been working out for awhile and we did a lot of heavy back-squats. And a bunch of other stuff. You can guess the outcome. Rhabdo. Brown (Dark Tea) colored piss back at the job (it was a lunch time workout), a conversation with my wife ("Do you think the coffee I drank could go through me that quick?" -- young, stupid, and naive), and a visit to the E.R. I spent a week in the hospital getting fluids pumped through me and praying I had not destroyed my kidneys. Everything turned out fine. In this case I really didn't have any symptoms other than the brown pee. My CK level was around 280,000 (Off the fricking charts). Fast Forward Sixteen Years. I am now 44 years old, back in Austin, and I have been doing CrossFit for about 11 weeks. This past Friday (July 31), I do a brutal WOD (at least to me). Temp in mid 90's, high humidity, Deadlifts/WallBall 15,13,11,9,7,5,3,1 for time. I did 175lb on the Deadlifts and used the 20lb medicine ball. Finished in 16:08. We then ran three 200m runs in intervals (I pretty much jogged them as I was wiped out from the workout). My back started hurting immediately post workout. It got worse as the day went on. By that night I felt like I could barely support myself standing (back weakness) and the pain was pretty bad. Urine color was dark yellow post workout, but normal that evening. We had guests(close friends) over for dinner and I asked the husband to take me to the Emergency Room while my wife stayed home with our 13 yr old daughter and 15 month old son. Because I had Rhabdo previously and had read the warnings on this site, I suspected this might be Rhabdo (desperately hoping it was not). At the emergency room I let them know that I was worried about Rhabdo and told them I had done a very hard workout. The tests came back positive (32,000 CK count and some other worrisome levels that showed decreased kidney function). Three nights later on Monday morning I was released from the hospital. My CK count was down to 6,000 and the other levels that are markers for kidney function were normal. This Friday I am going to a GP to get checked out and do another blood test. Hopefully my CK count will be in the normal range. 1)Symptoms may be pain or brown or very dark yellow pee. The warning bell went off for me because my back hurt a lot and I didn't remember injuring it during the workout. Also that night I felt extreme weakness in my back and I felt light headed. 2)DO NOT TAKE Motrin or Aleve (or any other related pain reliever/anti-inflammatory) if you at all suspect Rahbdo. The doctor at the hospital indicated that is the worst thing you can do when you have Rhabdo because the additional stress on the kidneys. 3) Do not think that because you have been doing CrossFit for a few months you are protected from Rhabdo. I came to CrossFit having not worked out for six months. In the last 2-1/2 months I have gotten in very good shape (for me). That is probably what got me. I could now push through I WOD with high intensity where before I could not. Ramp up slowly. You've just got to be knowledgable and careful. Put it this way, I'm coming up on nearly 3 years of CrossFit, and today's workout was (going to be) 3 rounds of: 50 Double-Unders, 50 Hip Extensions, 50 GHD Situps. Knowing that I haven't done GHD situps (or high rep hip extensions) in a *very* long time, even though I've been doing CrossFit consistently for a while, I subbed 35 hip extensions, and 20 GHD situps. I've brushed with rhabdo myself before, probably not full blown, but dang close, when I did a heavy strength bias last summer, and came back, somewhat easing into it, but then did Angie my 3rd or 4th metcon back. Bad idea, couldn't put my arms above my head, or fully extend them, for probably a good week or two. And when I came back, I had in fact whacked some muscles because I couldn't do any more than a single strict pullup about 3 weeks after the workout (before I could do 6 or 7 strict, and about 35-40 kipping). It was my stupid fault, I even said to myself "I should do half Angie", but decided to do it full out. Got a good time (for myself back then), but just was stupid. You just have to be careful, that's all. There's some movements that are more prone to inducing rhabdo, be on the lookout for them. If there's any doubt, scale it, you can do it with less scaling next time. Ask around, there's lots of folks on the forum who know their stuff, but best of all, go to an affiliate, they'll help you work through it to help prevent rhabdo. I am 5'4" 123lbs and in average shape. I started crossfit 2 weeks ago. My first week I attended 3 one hour long sessions, my second week I attended 4 one hour long sessions. My coach modified my workouts the first five sessions (less reps and less weights) after the fifth session I did the same workout and WOD as the other members of the class. During the workouts I felt good (no nausea, I could fully extend my arms and legs, I drank water when I was thirsty, etc...)After every crossfit session almost all of my muscles were sore. Two days after my seventh crossfit session both of my biceps just above my elbows were unusually sore whereas all my other muscles were no longer sore. My left bicep just above the elbow joint was in more pain than my right bicep and was slightly swollen. I told my husband, and at the time he did not seem too concerned. Later that night (3 days after our seventh crossfit session) we googled crossfit injuries and came across Rhabdomyolysis. My husband (who is very cautious when it comes to health issues) saw an image of a woman who had a similar injury and tested positive from Rhabdo. We promptly went to the Emergency Room to get an expert opinion. The ER doctor immediately tested me for a blood clot with an ultrasound and an x-ray (which came up negative) and was under the impression the injury was a strain or a minor tear in the bicep. My husband brought up the possibility of Rhabdo to the ER doctor who said, "Rhabdo is extremely uncommon and is unlikely due to the fact the injury is isolated to the bicep". Despite the doctors recommendation my Husband insisted on getting the test for Rhabdo performed. The results came back positive I had a Creatine Kinase level of 394,809. We later discovered the test had been incorrectly performed and the actual CK level was 31,992 which is still very high and a patient with a CK level above 5,000 should be admitted to the hospital. I was immediately given a saline solution then a saline and sodium bicarbonate solution via IV. I was given a second blood test 6 hours after my first blood test to check my CK levels as well as other Kidney Function (Creatinine, Blood in Urine, etc...). 6 hours after treatment began my CK levels dropped from 31,992 to 29,456. 18 hours after treatment began my CK levels dropped from 31,992 to 28,708. 29 hours after treatment began my CK levels dropped from 31,992 to 12,408. All blood and urine tests thus far have not indicated any abnormal kidney function. I am still in the hospital and my next blood test is in scheduled shortly. I can not be released until my CK levels are at an acceptable level (maximum of 5,000) I can not stress this enough, if you have any reason to suspect you have Rhabdomyolysis, go to the Emergency Room immediately. My urine was not a dark color and my only symptom was a sore and swollen bicep just above my elbow. If Rhabdo is left untreated it can lead to kidney failure which is very serious. Again, if you have any reason to suspect Rhabdomyolosis insist that you are tested for it (the doctors are under the misconception this is an incredibly rare disease and you don't have it unless you are in a lot of pain). The doctors need to verify that your Creatine Kanise levels are within a normal range and your Kidneys are functioning properly. Early detection is the key to successful recovery!!! This is coming from someone who is currently in the hospital with Crossfit induced Rhabdomyolosis.